Numbers are pretty cool. I like when they line up in fun ways, like when the time is 12:34pm or the date is 11/12/13. It's fun. I knew I had a string of numbers coming up on my odometer, and with a trip to Barrie yesterday, I knew it was going to happen. I was ready with my camera and a mental note of how many KM I had left before I hit it. I had about 19 km to go when I left Mom's last night. I Google mapped where that would put me on my drive home, and kept my eye on the odometer. About 2 km from the number string, I turned down a side road and drove out of the way for a klick, feeling far more comfortable taking pictures on a lightly traveled side road than on the main highway. If you were driving around Fergusonvale last night, I was the one on the side of the road taking photos of her dashboard. 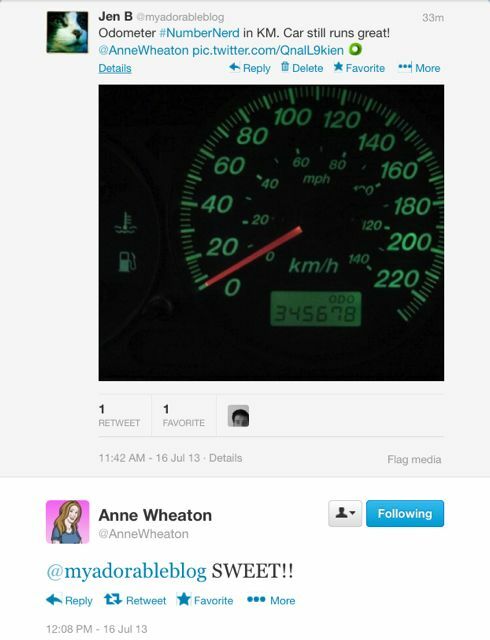 I learned about Number Nerd being a thing from Anne Wheaton, so obviously I had to tweet her my photo. The following is her response, which I love forever. I am into numbers as well. They are fun. Love that you had your camera on the ready for this photo. That's a lot of MILES, too! What kind of car? I remember when our '84 Cavalier Wagon went over 100,000 miles (this was in 1991). We were moving from Alabama to Ohio. My husband was driving in front. I flashed my lights and honked my horn to let him know it happened! Nowadays, 100,000 miles is NOTHING, huh? Love your 100,000 miles story - it is still cool when you hit numbers like that, but I guess we're all trying to make cars last longer and longer. Hoping ours does! Hahaa!! I love it when this happens, too!! 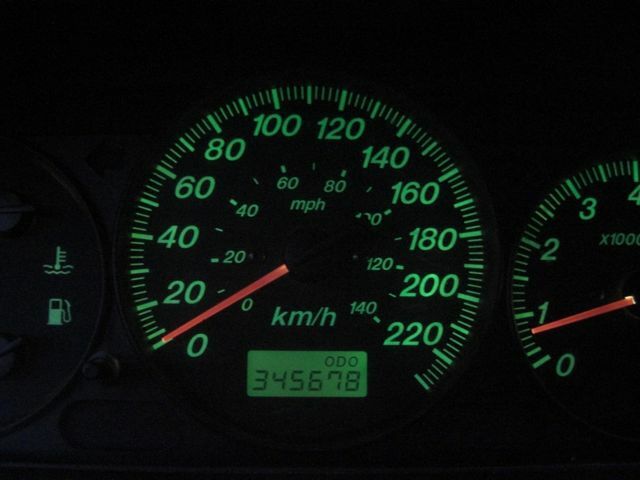 And when I had my first car, my boyfriend at the time and one of his friends noticed that I was thisclose to rolling over to 100,000kms, so we drove around a parking lot until it actually changed. Then, we cheered, high-fived each other and went home, satisfied with our bumpin' Wednesday night. Haha!